Please read carefully and fill out the Rafflecopter form accordingly for any and all entries you would like to be included in. I ask you to keep in mind that all entries will be monitored throughout the giveaway's duration and end. Also, I feel like I shouldn't need to say this, but considering previous giveaways on here, people who choose not to follow simple directions will not be tolerated. No 'chasing' over letting you know about incomplete entries will be offered and those entries will be considered invalid. This does not apply to questions asked in the comments, twitter, or facebook, but seriously, please be mindful that this is a giveaway. I understand that free is free on the internet, but it isn't free for me--so let's remember some etiquette and at least follow directions. Be a subscriber through any of the options listed in the Rafflecopter widget. My giveaways are for my subscribers, and I don't like it when people subscribe just to enter a giveaway then promptly unfollow, so I would rather you do not enter if those are your intentions. I tried to make it easy, as you are only required to leave one comment (please click for instructions), and follow through a single network. So do just one, or all of them, it's up to you. Giveaway will close at midnight on December 17th, then the winner will be selected and contacted. If the winner cannot be reached, their prize will be forfeited and another winner will be chosen. I know I may have come off rather stern above, but please don't be afraid to ask me any questions! I don't bite, promise. congrats to Anna for winning the giveaway! Disclaimer: The color Mildew in the Show Pony palette has been swatched once then immediately sanitized. None of the other colors in the palette have been touched or used. The travel size of Delinquent has been uncapped once, but never for anything other than photos in a previous post. It is also the only product that has not been purchased by mu-tokki herself. The giveaway winner will receive some cosmetic sanitizing wipes for extra measure. Please be advised that if you feel uncomfortable about any of these details, it is probably best not to enter this giveaway. 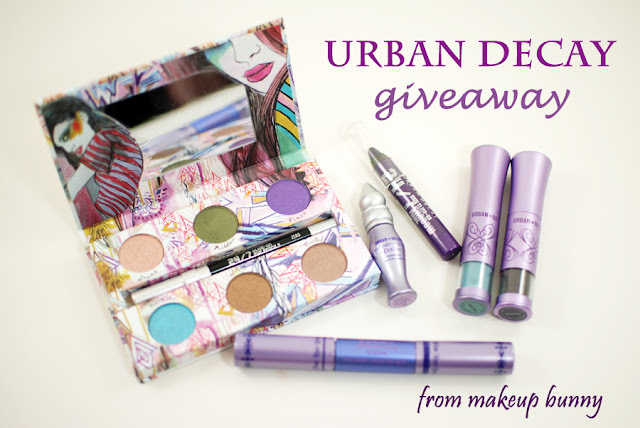 Disclosure: We are not affiliated with Urban Decay and are not compensated in any shape or form for hosting this giveaway.